THESE RUBS MAKE GRUB MIGHTY TASTY! Go ahead and chuckle, but don't let the name fool you. 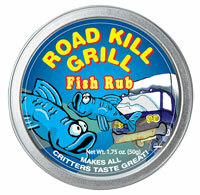 These Road Kill Grill Fish Rubs are some of the most tantalizing spice rubs you'll ever try! The Road Kill Grill Fish Rubs are all about succulent flavor and juicy tenderness. They seal in flavor and moisture when grilling, broiling or roasting. The Road Kill Grill Fish Rubs offer a proprietary blends of herbs, spices and secret ingredients that tempt the taste buds and bring friends and family back for more. Makes a great gift for the grill-master in your family too! Not just for the cook-out season, they are the new staple in year-round kitchens and indoor grilling.